LaBeouf swiped those exact words several months later when Howardcantour.com premiered on Short of the Week, repurposing my writing as his own director’s statement. It was hardly the most audacious bit of recycling he’d done in this instance, though: Eagle-eyed online viewers soon realized that the short itself was ripped off from a Daniel Clowes comic, and once people began accusing LaBeouf of creative plagiarism, he claimed that his theft was intended all along to be performance art, doubling down hard on that idea in the years to come. Whether he was crying in a Los Angeles gallery or grimacing through a self-retrospective in New York, LaBeouf came to be better known for his art antics than his acting. People continued to wonder what he would do next, but only because self-immolation felt like the most natural endpoint. Imagine my surprise, then, when LaBeouf turned up at Cannes earlier today as a clean-cut, well-dressed, polite performer for hire. He’s here to promote Andrea Arnold’s American Honey, where he stars as Jake, the ringleader of a ragtag young crew that crisscrosses the country selling magazine subscriptions — mostly to finance an endless road trip of drinking, flirting, and screwing. 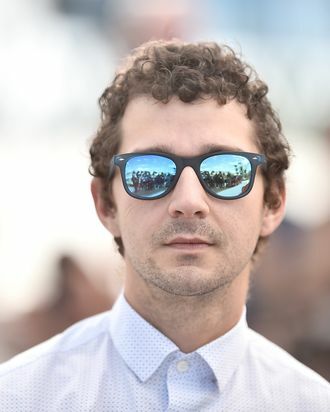 In the film, LaBeouf wears a rat tail and, frequently, little else, but at the press conference, his hair was cut short and combed, while his crisp white dress shirt was buttoned all the way up. Can Shia find his way back from the performance-art wilds, a la Joaquin Phoenix, and reestablish a big-studio career? Does he still want to? It isn’t clear, but today’s press conference was at least an encouraging step when it comes to sense of self: LaBeouf has often plunged so deeply into his roles that it unnerves his fellow costars, so to finally see him so put-together off-screen perhaps suggests that he’s found a way to reconcile work and life. There’s a charming sentence in the press notes for American Honey that refers to LaBeouf’s nonprofessional costars as “spirited debutantes who may or may not decide to pursue the acting profession.” Even LaBeouf, who’s been acting since he was a child, seems to have been at that crossroads as of late. I wonder if he’s finally decided which way to go.